Yesterday's New York Post had a cartoon by Sean Delonas depicting the author of the stimulus bill as a chimp. There's an outcry today, from Rev. Al Sharpton and others. Here's Sharpton's statement. The cartoon in today's New York Post is troubling at best given the historic racist attacks of African-Americans as being synonymous with monkeys. 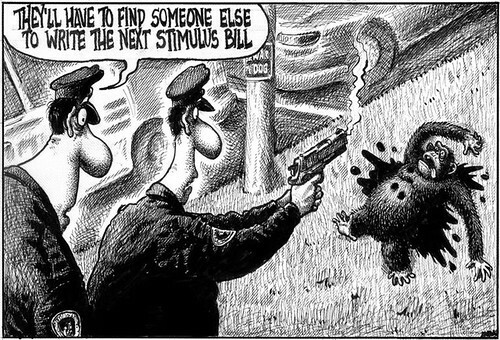 One has to question whether the cartoonist is making a less than casual reference to this when in the cartoon they have police saying after shooting a chimpanzee that "Now they will have to find someone else to write the stimulus bill". I must admit, I'm uncomfortable with this imagery. I sense racial overtones, and the chimp joke after the woman was attacked in Stamford, Connecticut is truly unfunny. With President Barack Obama paying his first visit to Canada, I ask you this... Do you think this cartoon is racist? Anytime you compare a black man to a monkey, it's racist. And a couple of cops shooting the monkey? That's super rascist. The cartoon is a shot at the stimulus plan - not on Obie. Therefore, it is not racist. The timing is insensitive considering the recent attack on the woman - there was nothing funny about that. People love to throw the word 'r' word around. So much so, its starting to lose its meaning. I'll buy the fact it's not meant to be rascist, but it's clearly insensitive. Not only because that poor woman had her face torn off but because Sharpton's right when he refers to the "historic racist attacks of African-Americans as being synonymous with monkeys". But I like the response from Obama's camp. They don't read the New York Post. Didn't Nancy Pelosi write/table the bill? Hey Tee, perception is reality, right? The average American will think Obama wrote the stimulus bill, even though it's likely the work of several people. To me it represents comparing the law makers to a bunch of monkeys. But if folks want to be offended go ahead. I guess I've been poisoned against The New York Post since I first heard Public Enemy's A Letter To The New York Post from Apocalypse '91. But if they're not comparing Obama to this crazed chimp - and BTW, why should anyone have such a creature in their possession - then I don't see that the cartoon makes any sense. Racist.Like it or not Obama wil be seen as the author of the stimulus bill. When I first saw this cartoon (before any mention of protest) I thought owch that is a tad harsh making fun of something that was so awful, the woman getting her face ripped up by the chimp. (if anybody missed that do a search, very sad story). The point of the cartoon is that the bill was a mess, like it was written by monkeys. No way is it saying Obama is a monkey. BTW I supported Obama and am no fan of Murdoch, NY Post, Rush, Malkin, or any of those clowns. The cartoonist has said the monkey is not meant to be anyone in particular but if it was to be in the image of anyone, it would be Pelosi. Seriously, is he retarded? I wonder if he wants salt on the foot that's in his mouth right now. "to those who were offended by the image, we apologize." Can't you just say - we're sorry? The End. Of all the years I listen to the Humble & Fred duel, not once did I hear cut throat humor, now thats "Greatness"
I suggest you look at this video first. Then comment. Is it ok to call a white dude a monkey and not call a black man that? What if they are both acting like monkeys?